With this series, we’re taking the time to highlight some of our favorite projects that we’ve been a part of, as well as the talented teams who have brought our wood to life by installing them in their homes. 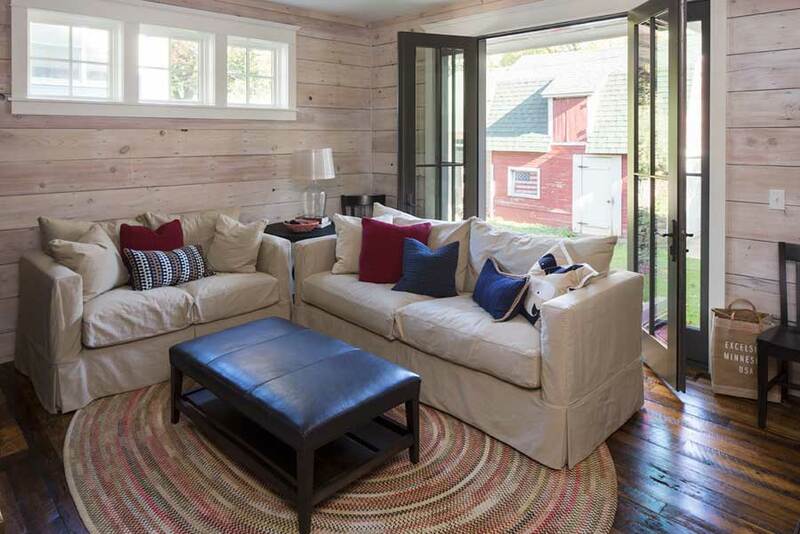 For our first post, we talked about a contemporary home built by Sustainable 9 featuring our mixed reclaimed hardwood. For the second installment of the Manomin Resawn Timbers Featured Project Series, we’ll be diving into this antique oak skip planed flooring project done by Mark Williams Custom Homes Inc. We are fortunate enough to provide wood for some stellar home building companies, and Mark Williams certainly fits that bill. Check out some of their latest builds and see for yourself! Antique oak is a gorgeous choice for any home, bringing both a sense of rustic warmth and luxury that makes it truly a unique flooring option. However, what really helps bring the beauty of antique oak out is the surrounding details. 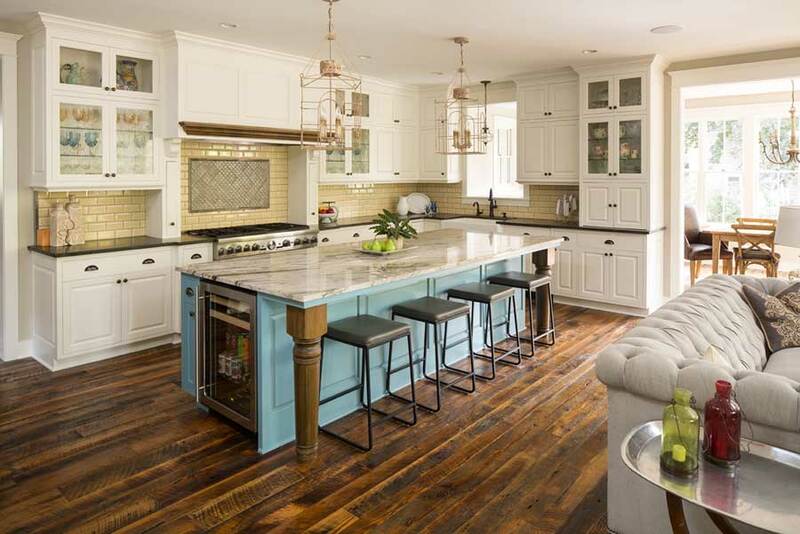 The blue island cabinets in the kitchen are a great contrast with the antique wood. 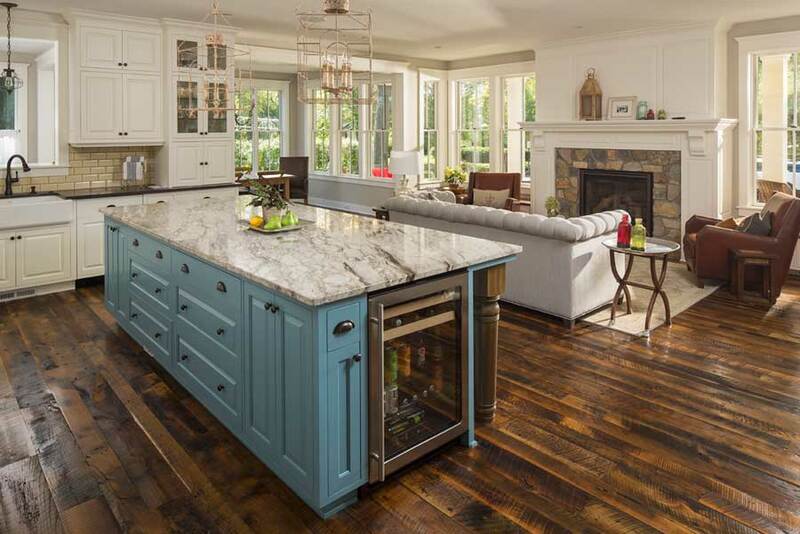 Take a look at that built in mini-fridge too, making this kitchen a great place for entertaining guests. From this angle of the kitchen, we can see the white cabinetry, which once again plays well off of the antique oak flooring. With multiple seating options located in the kitchen, this layout allows for enough space to prepare food while still being able to socialize. 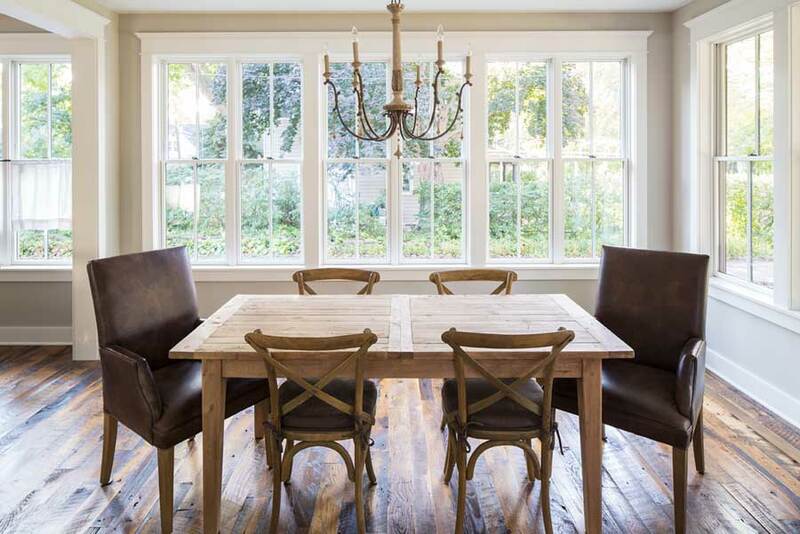 Moving on to the dining room, the large windows allow for natural light to get through and the simple layout resembles the trendy minimalism design that is so prevalent today. The antique oak, combined with the other shades of brown in the furniture, really help the warmth shine through in this area of the home. 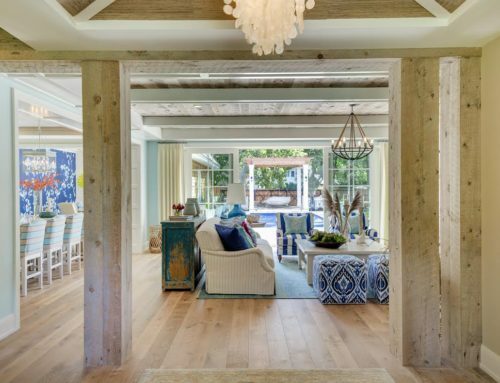 In this cozy area of the home, wood dominates. 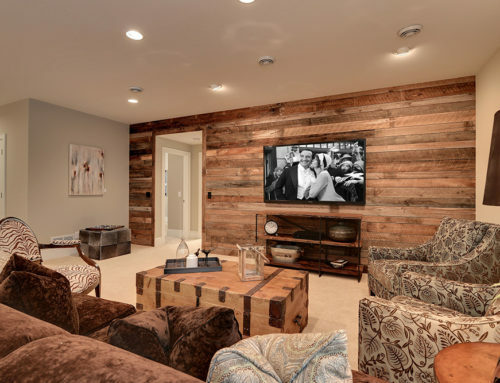 Not only is the antique oak used once again, but wood is also used for the wall. 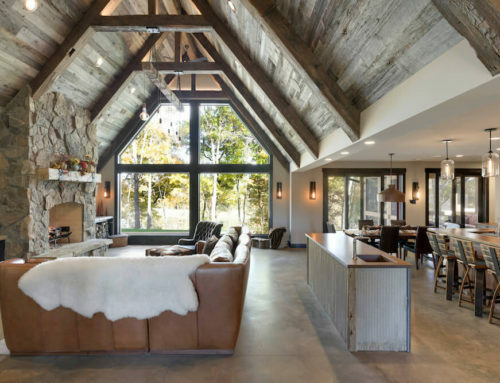 This home perfectly illustrates that you don’t have to give up comfort for luxury. 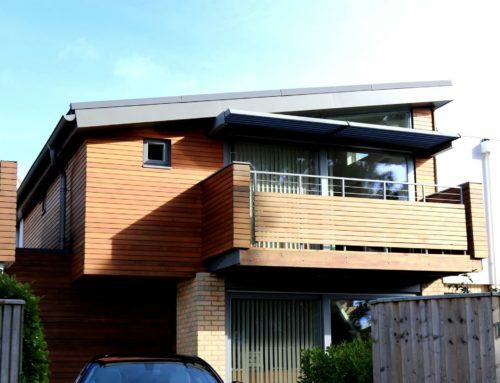 Use Manomin Resawn Timbers for Your Next Home Project! As the premier wood supplier in the Midwest and beyond, Manomin Resawn Timbers is the perfect supplier for your new home construction or renovation project. Take a peek at our diverse collection of available wood options and see some of the other projects that have used our wood to create vibrant interiors. We always enjoy speaking with interested home builders and contractors to discuss how we can help with an upcoming project, so give us a call to set up a meeting! 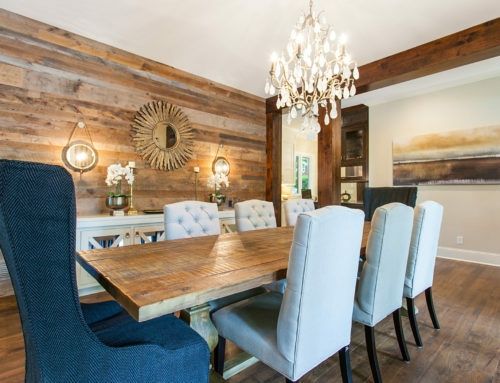 Remember, when it comes to reclaimed wood, no one does it better than Manomin Resawn Timbers.